I've never really been a fashion blogger - I openly admit I'm not cool enough for that. However, at the moment there are so many great things in the shops, as I blogged about previously, and that has of course transferred to the covers of various magazines. The September issues have been out for about a month, filled with lots of gorgeous clothes, but there were two that really stood out on the rack - including one that compelled me to buy the magazine for the first time - and so I had to blog about them! 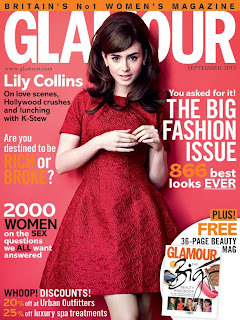 The first is Glamour, which I've bought on and off for years - mostly for the articles, occasionally for the free gift, but this time I bought it solely for the cover. 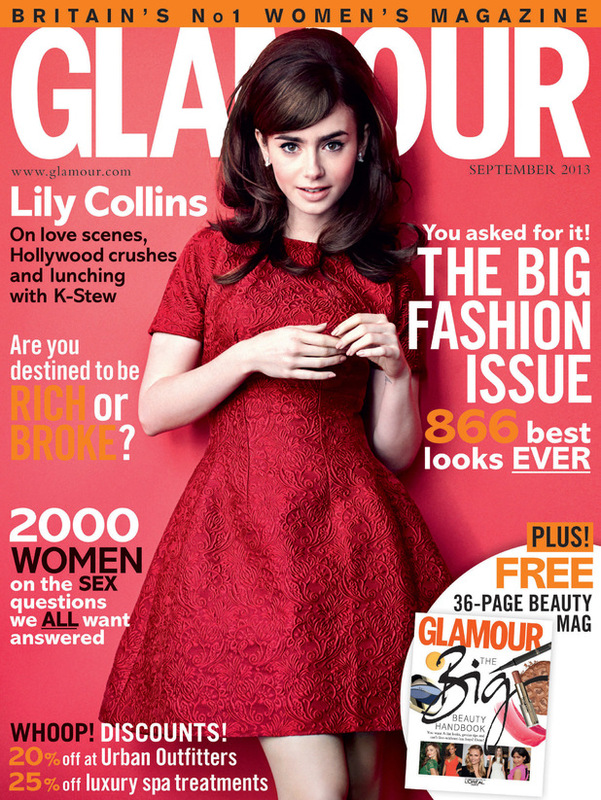 How amazing does Lily Collins look?! I am a sucker for a red fit and flare dress, and that Dolce & Gabbana number is just gorgeous. The shape is beautiful, particularly in the skirt, and I love the overlaid pattern which gives it a slight Victorian edge whilst stilling looking fresh and modern. Frankly, I'm amazed I haven't see a high-street copy of it yet - although if you do, please let me know! Combine that with her gorgeous porcelain skin and very simple make-up, plus the amazing beehive (a hairstyle I always desperately want to achieve but never can) that brings yet another retro element into the look, and I just love everything about it. It looks like something that would be absolutely perfect for a winter special occasion, such as a wedding or a Christmas party, and is something I'd love to try my hand at recreating. The only thing I'd really like to see is the shoes they put with it - I can imagine it working really well with a classic Mary Jane for the ladylike edge or something with a bit of sparkle as a 'party' outfit. If Lily's Glamour cover is picking up on the vintage ladylike vibe of the coming season, then Katy Perry's cover for Elle is all about the rebellious, punky side of things. I'm not quite sure I'd be brave enough to wear the Dolce & Gabbana checked peplum top and shorts she does (have I unwittingly outed myself as a Dolce fan in the course of this post? ), but I really like those Louboutin boots - they look so awesomely bad-girl and would actually go with quite a lot of things I already have in my wardrobe. Equally I also love the rock-chick vibe of her hair in its long, choppy, messy layers and the smudgy 60s-style eye make-up. And it's certainly easier to achieve than Lily's look, at least for someone like me who is ridiculously lazy and cack-handed. I have bought a very similar dress from New Look (see my AW Top Six post for more details!) so can see myself rocking out that hair and make-up with the dress to make it a bit more casual and relaxed, or working the look on a night out. Or, for the hair, even just everyday - I think when I next get it cut I might ask for that kind of layers put in. Overall, I think these two covers both do a great job of conveying the vibe of the season in brilliantly different ways - both taking the 60s influence that has been huge on the catwalks and taking it in opposite directions. Plus, providing you're more adept at hairstyling than me, both looks are really wearable and have lots of elements that could transfer well to a 'normal' outfit. And now I want to go out and buy All The Things. What do you think of these looks? Would you take any aspects from them and use them in your own outfits? And which September covers were your favourites? Let me know in the comments and have a great day! I loved the Elle cover too this month, it really stood out from the crowd. Although I am more bohemian/indie/rocker with my dress sense so I think it was more adored through personal inspiration. A perfect start to fall fashion though. Hi Pippa, thanks for the comment! I definitely agree about the Elle cover standing out from the crowd - it's the first time I'd ever actually bought it and the cover image played a huge part in that. I like the fact that it's something you could incorporate quite well into your own look as well. The pattern of Collins' dress really is lovely. I'm a sucker for Victorian stuff too, ha. She is just adorable. I'm not a reader of fashion magazines myself though. Hi Cassela, thanks for your comment! It is a truly lovely dress, just wish there was a cheaper version of it out there somewhere :) And yes to Victorian stuff, I'm a sucker for anything like that, especially boots or coats.